Here is the video of the UK parliament’s debate on cannabis after 220,000 citizens signed an online petition. Now that more facts and figures on cannabis are known to government, they can’t pretend that they don’t know about the medicinal properties of the plant. Hopefully this will pave the way for a lawsuit. We need cannabis in society because millions of people are dying from pollution and cancer each year. Cannabis can stop this rot, if the people will unite. After the successful online government petition to legalize the production and use of cannabis, the UK parliament has to now meet and discuss the topic on the 12th of this month. After speaking with UK activist groups, the message going around is; anyone living in the UK should contact their own local MP and ask them if they will be at the parliament debate. The Tory government would like nothing better than a sparsely attended debate. It will take you a few minutes but the difference could be life changing. Sick and elderly patients can really benefit from the non toxic plant. Increased sleep and appetite are the bed rock of recovery and unlike toxic pharmaceutical drugs, the only side effect of cannabis is a bliss like euphoria. Take the time to call or email your MP because the drug war has failed. We tried putting everyone in jail and still cannabis use increased. If we remove the black market, then we can make sure that young people don’t have as ready a supply and we can also improve the quality of pot. Be the difference, contact one of the organizations below or directly with your local MP. We live in a democracy, it is high time we started using the system instead of being used by the system!!! Clark French is a multiple sclerosis sufferer. Out of all the medication availabe today, cannabis is his best option. The UK government allows cannabis to be grown and processed by a company called GW Pharmaceutical. They put cannabis extracts into a bottle, label it Sativex and hey presto, cannabis is legal in the UK. What a beautiful little trick. Cannabis is clearly illegal to grow in the UK but when a bunch of pharmaceutical executives lobby their friends in government, Sativex is born. Cannabis is schedule 1, which means it has no medicinal benefit, Sativex is schedule 4. GW has made something very illegal into something very useful and all for a huge profit. Until money leaves medicine, we must always be wary of anything they say. Big pharma have and will continue to sell us drugs that are dangerous to human health. Cannabis is in the process of destroying the old big pharma world. Today it is understood by the progressive element in society that pot is a powerful medicine. The older you are, the better cannabis is for your health. If you are sick, at the very least, your pain will decrease, you will sleep and eat better and you will get high. GW have scientists and doctors telling you that cannabis is good for you. UK government officials are fighting to have Sativex sold in as many countries around the world as possible. We have to tolerate this situation until our slower witted members of society figure out that cannabis is the cure to ill health rather than the cause. Up to half of pharmaceutical drugs can be replaced by cannabis. The video below highlights the problem of sick citizens being denied affordable health care. Big business can be replaced by Buy local. We don’t have to have giant corporations holding our health in their profit accounts. So now it is your turn. Talk about the hypocrisy of legal GW cannabis and illegal everyone else’s. Join or start your own activist group and lets start taking back control over our lives. Our governments don’t know what is best for us, and they certainly have no authority over how we choose to heal ourselves. Summer time has slipped from our briefly worn sandals. There were public smoke outs, festivals and fun, but now that September has sobered up our hopes for an endless summer, it is time to take stock of where we have come from, and where are we going. We had senior law enforcement officials declaring that they no longer were interested in pursuing small cannabis growers and consumers. It is nice that they thought we were waiting for their permission, but seeing as cannabis is the only known non toxic cancer fighting substance on the planet, we are going to keep on using it regardless. One in every two people will get cancer so when the scientific news broke that cannabis kills cancer cells, you might have thought that was the end of the prohibition debate. With this new information the UK government did two things. It declared that cannabis was still a dangerous, evil, naughty drug with no medical properties and it also granted a license to their buddies at GW Pharmaceutical to grow cannabis and sell it as medicine. Nice move from the government, right? Out of one side of their mouth they told us that the dirty hippies are completely deluded if they think cannabis is medicine and then with the smiling, lobbyist lipsticked other side they have awarded GW Pharmaceutical a medical cannabis growing license. GW Pharmaceutical is now worth one and a half billion on the stock market. Their main product, Sativex is just cannabis in a bottle. It costs a fortune and is one of the only cannabis products freely available to the public. If you haven’t spotted it yet, the UK government is full of nonsense on cannabis. GW knows there is a potential 100 billion euro business in Europe and they have paid off the Tories for exclusive access to this market. GW’s cannabis is grown in clean, sterile conditions. These conditions are quite easy to design and implement for your grow, so GW really needs cannabis prohibition to continue or else they will lose their monopoly. Don’t forget that while this little game is going on sick people are suffering. From MS to chronic pain to cancer, we have a simple solution to human suffering but our governments are blocking it. We sat down with Teeside Cannabis Club’s top guy, John Holliday, to get his take on the situation. John has had a dramatic summer with DailyMail attacks and public policy victories. “Once Labour Police and Crime Commissioner for Durham Constabulary Ron Hogg announced that his officers wouldn’t enforce prohibition on low level production and consumption of cannabis, we new the game had changed. We have often had ex police and former officials come out and support cannabis reform, but Ron Hogg, and then other senior officials came out to support change while they were still in a position to do something. From this stunning public endorsement for change we rolled onto the successful petition to allow the sale, use and production of pot in the UK. On October 12th, there will be a commons debate on the subject. This is where we need the publics help. We have placed cannabis on the table and now the public has to have it nailed down. We encourage everyone to communicate with THEIR local Member of Parliament. Cannabis is not a hippie question, it is a health one. Besides its anti-cancer properties it alleviates the pain and discomfort from a wide range of medical issues. One in two people will get cancer so cannabis prohibition is directly threatening everyone’s health”. There are many other activist groups calling for a similar strategy. If you care about this issue, we need your help. Send an email or call your local MP and start talking to them about the health benefits of having cannabis freely available for sick people. Prohibition only works for drug dealers and monopolists. Colorado legalized pot last year. Health and happiness increased and pharmaceutical drug sales went down. Colorado has made so much money from the herb that they will have to start giving citizens back some of their taxes. We each have a personal journey to travel, but it is in our organized actions that we will collectively help manifest change in our beleaguered, old world. Below are a list of UK groups you can contact. The cannabis debate is now in parliament, if we put enough pressure on our local members of parliament, this might be the first pain free christmas that some patients have experienced in a while!! What does the upcoming UK parliament cannabis debate mean? After a successfully organized and run online petition to legalize the production, sale and use of cannabis, the UK parliament must now debate the subject. 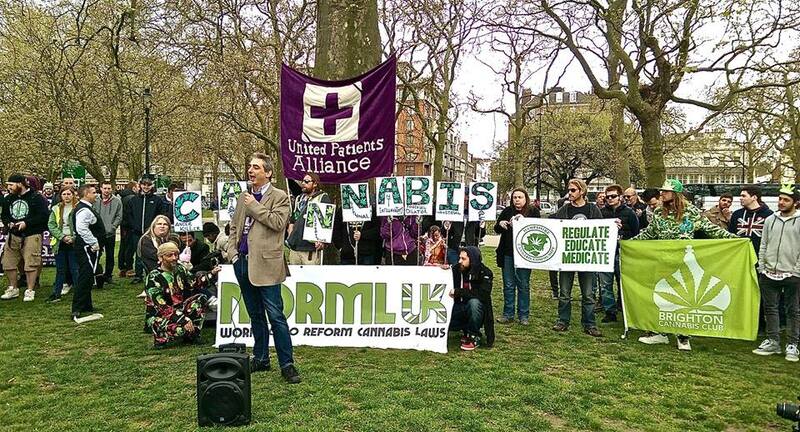 British cannabis activists should be very proud of their efforts. Over 200,000 signatures were collected. For establishment politicians this is a nightmare. They are under huge pressure from pharmaceutical lobbyist money to kill any cannabis debate. A chronic pain sufferer has to take a handful of toxic medication every day. Cannabis can replace all these pills and allow the patient to lead a normal, healthy life. The way our political systems have developed, politicians and business are far to close to each other. This relationship causes things like pollution and prohibition, but when people stand together, our prostitute politicians will do as they are told. On Monday, 12th of October we will witness a piece of political theatre. We will see a parliament debate on cannabis attended by only a few MPs and little media coverage. The establishment does nice business with pharmaceutical companies. Big pharma has evolved from a life giving industry into just another ATM for giant corporations. Selfish politicians want to give the impression that this is not an important issue. They are thinking of campaign contributions instead of looking at the science on cannabis. It is clear that cannabis is one of the most amazing natural medicines known to man. Here is a list of 700 scientific studies that show the medical benefits of the plant. Politicians have tried imprisoning, then laughing at this issue. That hasn’t worked so they will give ignoring the public’s demands a try. What they don’t realize is, we will never stop pushing for medical cannabis. The establishment has portrayed cannabis users as hippie stoners but the truth is very different. Cannabis is a creative fuel as well as the best, non toxic medicine we have found. We are not lazy, we are committed. Why should we live in a world were only billionaire companies get to control medicine. Look at your history books, every greedy concentration of power and money has ended in people getting needlessly hurt and killed. Opioid pain medication kills thousands of people each year in the UK. Of all the drug overdose deaths, 82% is from prescription drugs. We do have a drug problem in Europe, but it is the legal drug dealers that are causing the most harm. Alarmingly, new statistics tell us that one in every two people will get cancer in the UK. Cannabis is a known anti cancer tumor substance. Each time you use cannabis you are lowering the risk of getting cancer. Imagine the mind that believes they have the right to prohibit you from protecting yourself against cancer! We are firmly on the road to cannabis legalization. This is important to people who suffer in silence. UK activists are dedicating their time and energy so now lets all stand up. Together, we can change this war torn, polluted world. Below are a list of fantastic UK organizations. They are filled with friendly, dedicated activists, and they need your help. Medically speaking, cannabis is a game changer. We know it can kill cancer cells while leaving healthy tissue undamaged. It can treat severe pain and bring down inflammation in a natural, non toxic way. Every time you eat, vape or smoke organic cannabis, it boosts your mental and physical health. Thanks to 21st century technology, enough people have understood the true power of the plant and are now busy spreading that information. We have recently had a successful UK petition to immediately change the status of cannabis from illegal to regulated. Incredibly, the government’s response was to declare the plant evil and dangerous. The Tory leader David Cameron is following the establishment line on cannabis. Of course he is hoping that nobody remembers that he was disciplined while studying at Eton college for his own cannabis use. We also know he is bought and paid for by multinational pharmaceutical companies. It is these giant pharmaceutical companies blocking medical marijuana today. They make a cool trillion dollars a year, with no competition until the truth on medical cannabis got out. They have enjoyed their position as top dogs. Private jets and unlimited expense accounts have seduced big pharma employees. Unfortunately for them, a dynamic little plant called cannabis is about to rock their world. Up to half of all medication available could be replaced with pot. Big pharma are happy to create life long customers. They begin with pills for your illness and soon you must take more pills for side effects. Once you get onto the medical hamster wheel, they won’t let you get off. Thankfully, we now have other options. Praguepot got a chance to speak with the Political Director of the United Patients Alliance, Jonathan Liebling. The alliance brings together sick people who benefit from cannabis and give them a voice. Due to the legal status of cannabis in the UK, sick people must become criminals to heal themselves. Jonathan had been treating his own serious medical condition with cannabis until the police burst through his door. After being arrested and harassed by the system he had a simple choice, continue his cannabis activist journey, or hide away from the truth. Luckily for us, the injustice he suffered has made him more determined to help spread the word. The Patients Alliance plays a vital, public role. Sick people are needlessly suffering because politicians can’t or won’t act. Together with the alliance, Jonathan helps people with practical knowledge of the plant’s medicinal properties. They are pushing for the immediate rescheduling of cannabis so scientific research can begin in the UK. Cannabis is already grown and sold in Britain through GW Pharmaceuticals. When you grow for a billion dollar company, the plant becomes magically legal. Either using expensive Sativex, or growing your own medicine, pot helps boost our system and attacks the causes of our ill-health. One in every two people are going to get cancer so this is not an abstract argument. Cannabis is spreading in America like a California wild fire. Legalization over there has brought a reduction in crime and an increase in public health. If we look closer to home, the Israelis have decisively embraced medical marijuana. It is being prescribed to old age pensioners with amazing results. Uk patients deserve the same access. 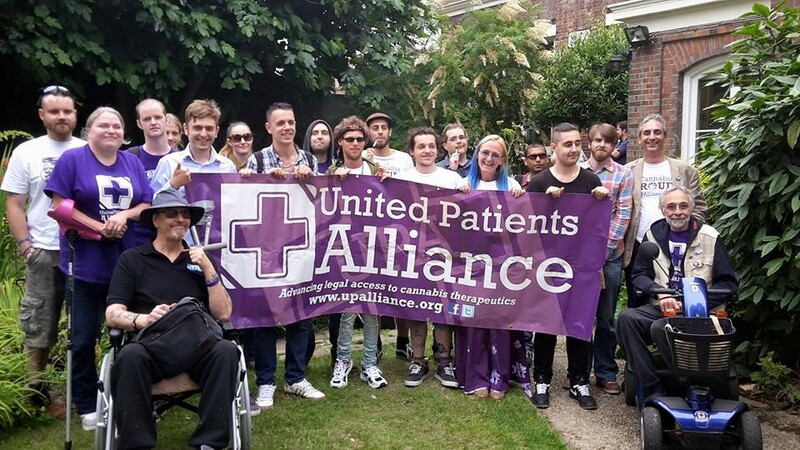 Praguepot encourages all UK activists to join the United Patients Alliance. Prohibition can only be enforced if we are divided. Below is a touching testimony from someone who beat cancer with cannabis. There is no legitimate law that can prevent you from staying healthy, so join the alliance and help put pot back at the center of a healthy society. A petition to legalize the growing and consumption of cannabis has topped 200,000 signatures in the UK. The Conservatives, lead by David Cameron has decided to pretend that all the new science we now have on the plant, didn’t happen. The same old tired arguments are rolled out. Cannabis is vicious, cannabis is evil, cannabis will make your brain fry itself! The problem with this old tactic is, we clearly know that cannabis is healthy for you. The US government even finally admitted that cannabis kills cancer cells. One in every two people will get cancer so there are billions of lives at stake. Cameron is a politician bought and paid for by pharmaceutical companies. Big pharma will have a huge portion of their business replaced by cannabis when people stop pumping toxic pills into their bodies and instead choose home grown natural pot. The scare tactics stopped working when the internet spread actual science to the public. We are now just as informed as governments. Colorado has not seen society collapse after it legalized cannabis 20 months ago. Crime went down, health has gone up and they now have more taxes to put into education. Look at more and more American states scramble to adopt cannabis. The UK government wants you to think they know best. However, when their former top scientist, professor Nutt came out and told them, and then the public, that alcohol and tobacco are far more dangerous to society than cannabis, they fired him. An elected government put their ideology and financial backer’s interests ahead of what is best for the people. We should never get used to this dirty way of doing business. They have acted treasonously. When a government doesn’t follow scientific evidence, you have to wonder, who are they listening to? The UK has never had a moment like this before. We have evidence from America and Holland that legalization does no harm to society, we have scientists and doctors backing up claims that cannabis is healthy for you and we have a public that is starting to unite around the idea that cannabis is healthy for you. We need more people to get involved. Join your local cannabis club, join Clear, Norml or Encod. All these groups are a vital component of change. The government hope that we will get tired of campaigning for cannabis legalization. When you see first hand the help cannabis gives to sick and injured people, looking away is not an option. We have mighty marijuana momentum, so lets make sure our politicians can’t ignore this subject. Stay united and focused on ending the cruelty of cannabis prohibition.